Katy, managing attorney of the Northeast Florida Medical Legal Partnership (NFMLP), is a highly regarded and committed health lawyer. Like Miriam, she has experience both in identifying and addressing systemic issues through impact litigation and in representing a large number of individual clients with Medicaid eligibility and services issues. 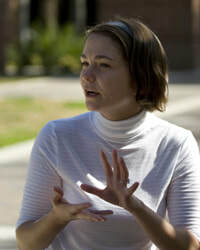 Katy began her legal career in 2008 as an Equal Justice Works fellow. Her two year fellowship generated several state court of appeals successes, two 42 U.S.C. 1983 suits, and culminated in a successful facial constitutional challenge to a state statutory scheme for the commitment of persons with developmental disabilities. Within a year of being hired to direct the NFMLP, Katy secured significant funding for the partnership-- the first time external funding has been obtained in the project’s 12-year history. Katy has taken a lead role in developing a statewide medical legal partnership (MLP) network and recently received funding to provide a series of webinars on public benefits programs available to low income Floridians, including the Medicaid program. Co-authored criminal defense attorney handbook, and presented to stakeholders throughout the state of Florida as a CLE course.